The anti-vaxxer movement has been growing over the course of 20 years, leaving unnecessary measles outbreaks in its wake. In 2018, there were 40,000 confirmed cases across Europe. A big part of the growth is due to online communities, where anti-science information can spread around like wildfire, and lies can sometimes spread faster than the truth. And once someone’s got the wrong idea about vaccines, it’s incredibly difficult to change their mind. For years anti-vaxxers have mainly been spreading the misinformation that vaccines cause autism, a myth that has been debunked many times. Now it seems the job of myth-busting may get even more difficult, as anti-vaxxers are diversifying their nonsense. A new study, published in the journal Vaccine, looked at anti-vaxxers on Facebook and found four main types of anti-vax content being spread around the site, straying into bizarre conspiracy theories even weirder than the ones we’ve already seen. 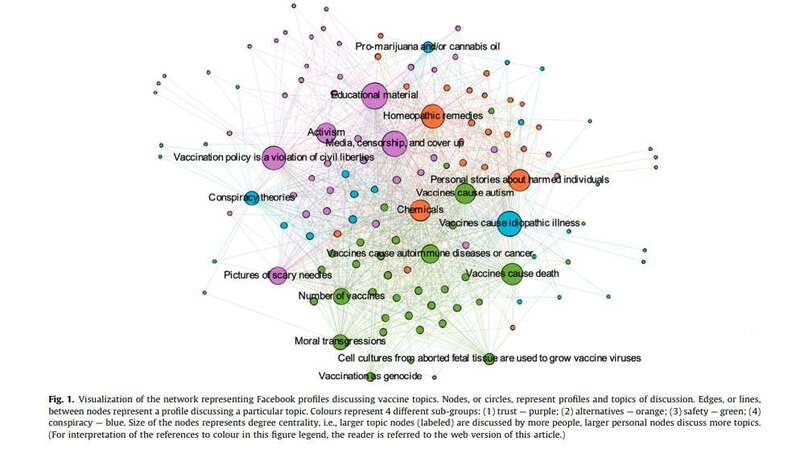 The researchers looked at posts and posters on Facebook to see who exactly is spreading anti-vax content, in the hope of finding a way to tackle it. To find anti-vax posters, the researchers looked at a video by a pediatric clinic promoting the (Center for Disease Control-recommended) HPV vaccine. Underneath the video, there were hundreds of anti-vax commenters for the researchers to choose from. Comments ranged from ‘‘you’ll burn in hell for killing babies” to accusing the clinic of being ‘‘brainwashed” for promoting science-based medicine. They selected 197 profiles to thoroughly investigate, and then combed through the types of posts they were sharing. The majority of individuals identified as female (89 percent) and/or were parents (78 percent). This might not be so surprising after it emerged last month that anti-vaxxers are specifically targeting pregnant women with ads on Facebook. A smaller proportion of people reported an occupation (29 percent) and/or post-secondary education (24 percent). Out of the people whose political affiliations could be discovered, a whopping 56 percent were self-reported supporters of Donald Trump. By looking at the posts of the anti-vaxxers, the researchers found that they could be split into four main groups: Trust, Alternatives, Safety, and Conspiracy anti-vaxxers. Unsurprisingly, they found that belief in conspiracy theories was rife. Amongst some of the stranger theories was the idea that the poliovirus does not exist and that pesticides cause any clinical symptoms of polio. In total, 71 percent of anti-vax posts warned of conspiracy theories like this, with others spreading the idea that the government is downplaying the risks of vaccines in order to increase profit. The researchers found that these posters would post other conspiracy content, such as that NASA is releasing balloons filled with chemicals across the US. There is overlap between these groups, but, for example, the Alternatives subgroup was focused on alternatives to vaccines, including the bizarre belief that eating yogurt cures HPV. Members of the Alternatives subgroup would also post content advocating beliefs such as marijuana can treat cancer, AIDS, and other illnesses. The Trust group of anti-vaxxers were mainly focused on mistrust of government, science, and pharma, and the Safety group had safety concerns about vaccines (disproportionate to the actual risk of vaccines vs the risk of getting the diseases they are used to prevent). The research indicates that anti-vaxxers have diversified from the usual image of them spreading rumors about vaccines causing autism, so methods to tackle them will also need to change. The team hopes that the study will help fight misinformation by aiding public health campaigns attempting to educate the anti-vax community.